Born in Wanganui in 1894, Owen and family moved to Masterton in 1908 when he and siblings continued their schooling at Masterton Central School. His parents were Richard (a well-known fitness instructor) and Maria Jarrett. When he enlisted in 1915, Owen was assistant county clerk with Masterton County. He joined the NZ Rifle Brigade (service number 24/474), first training at Trentham and later Rangiotu. As part of 2nd Battalion NZRB he embarked in October 1915 for Egypt, where his unit spent a month in action against the Senussi attack from Libya. Owen sailed in France in April 1916 with the NZ Division and was soon posted to 3rd Light Mortar Battery, serving there for five months including the Battle of the Somme. Owen was promoted several times and in May 1917 was selected for officer training. This removed him from the Western Front while the battles of Messines and Passchendaele took place. 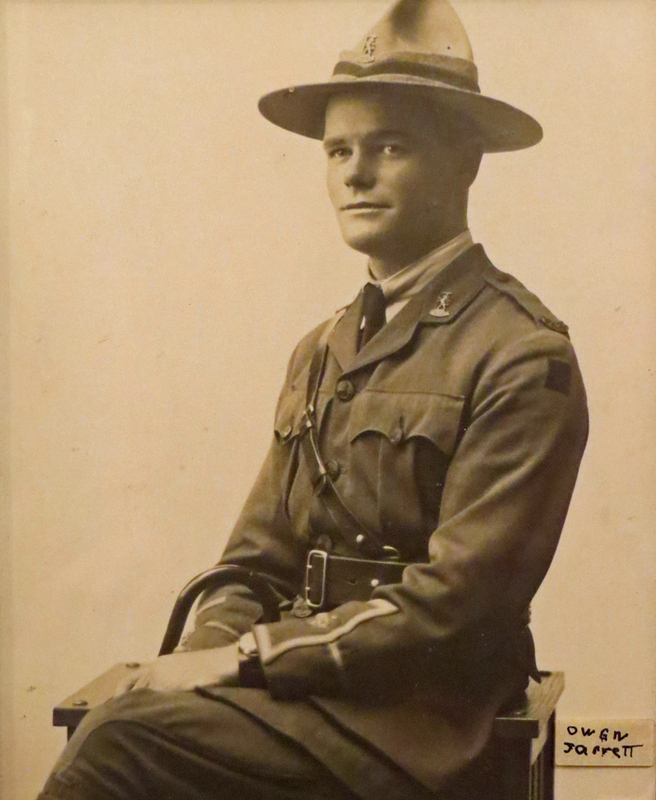 Owen was commissioned as a second-lieutenant and returned to New Zealand in late 1917 with other new officers. They were to train with reinforcements in New Zealand before returning to war. Owen went back to Britain with the 37th Reinforcement to further training at Brocton Camp. He joined the NZ Division in September 1918, back with the Rifle Brigade. During an attack on 8 October near Cambrai, Owen was wounded in the neck and died the same day. He is buried at Flesquieres Hill British Cemetery, France.